Home > Interest Rate > Home Loan - Why the time is right for State Bank of India - SBI customers to move to MCLR from base rate..! Home Loan - Why the time is right for State Bank of India - SBI customers to move to MCLR from base rate..! Why the time is right for State Bank of India - SBI customers to move to MCLR from base rate..! State Bank of India (SBI) chairman Ms. Arundhati Bhattacharya said on Jan 2, 2017 that the bank has decided to club the switchover fee with the equated monthly instalment (EMI) so that customers do not feel the pinch upfront. 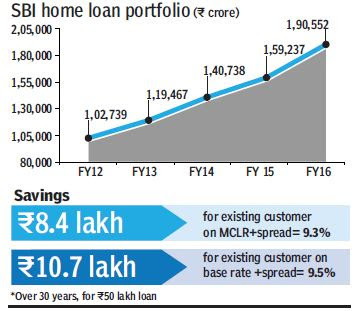 SBI lowering marginal cost of funds based lending rate (MCLR) by 0.9% to 8%, the time is ripe for existing customers to move from base rate to MCLR. To calculate the benefit, FE has considered an outstanding loan of Rs. 50 lakh, a tenure of 30 years and an existing interest rate of 9.5% (base rate + 0.25% (25 bps) spread). According to the calculation, existing customers will save Rs. 10.7 lakh over 30 years when they move to the current MCLR regime. Following the rate cut, SBI home loans are available at 8.60% for women borrowers and at 8.65% for others. At present, while 40% of SBI’s total loan book is on MCLR, only 15% of the home loan book is on MCLR. Meanwhile, customers already part of MCLR will save Rs. 8.4 lakh over a period of 30 years on a Rs. 50 lakh loan. The switching fee for moving from the base rate to MCLR will be Rs. 10,000 or 0.5% of the outstanding loan whichever is higher. SBI chairman Ms. Arundhati Bhattacharya said that the bank has decided to club the switchover fee with the equated monthly instalment (EMI) so that customers do not feel the pinch upfront. “We recommend borrowers to move to MCLR regime,” she said, adding that if an existing borrower under the base rate regime wants to switch without changing the loan spread, then it does not require any fee. “However, if one wants the full benefit of the MCLR rate, then the switchover fee needs to be paid,” she explained. According to SBI’s analyst presentation, its housing loan book stood at Rs. 2.05 lakh crore in Q2 FY 17 with a market share of 25.53% and in FY16, it stood at Rs. 1.9 lakh crore. RBI data showed that for the November 25 fortnight, the total housing loan book of banks stood at Rs. 8.15 lakh crore. In order to achieve monetary transmission by ensuring that lending rates are sensitive to policy rates, the Reserve Bank of India (RBI) has made it mandatory for banks to adopt the MCLR as the benchmark for lending, instead of the base rate, from the beginning of FY17. “The unprecedented surge in liquidity was followed by the fact that credit growth has gone down. Not only because our people were not in a position to take up all that work, but also because there were a lot of pre-payments,” she said. For the fortnight ended December 9, non-food credit was up 5.9% year-on-year to R72.39 lakh crore. On demand for housing loans, Ms. Bhattacharya said that the bank intends to meet builders to see what best can be done in order to boost realty sector. “I do not believe that cut in interest in the be all and end all for priming growth in the economy. We will be talking to builders what more we can do,” she said. The bank has launched SBI Bridge Loan for people who want to upgrade to a new house but have not yet been able to sell their existing loans. “We have created a product called bridge loan which can be availed on the existing property, pay the interest and within two years the borrowers need to liquidate the property and repay the loan,” Ms. Bhattacharya said. She said that in normal circumstances ATM availability is about 88-90% and of 49,000 ATMs of the State Bank group, about 40,000-41,000 ATMs are dispensing cash. “Cash availability in last one week has improved considerably and we are making efforts that in all ATMs there are two cassettes of Rs. 500 notes,” she said. On loan growth, she said that the current loan growth target of 11% to 12%. “At this point of time it is 6.7% to 6.8% and with this rate cut we are hoping that we are still be able to take it to 8% to 9%,” she said, adding that since there are only three months left in the year, it is difficult at this point of time to envisage what will it be.